The Triangular Fibrocartilage Complex (TFCC) is a ligament in the wrist that is commonly sprained. TFCC injuries are treated by Dr. Peter G. Fitzgibbons, MD at The Centers for Advanced Orthopaedics: Maryland Orthopedic Specialists Division. Dr. Fitzgibbons is fellowship-trained in both orthopaedic trauma and hand surgery, and is uniquely qualified to care for these injuries. 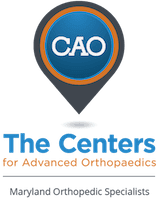 With locations in both Germantown and Bethesda, Maryland, he and a team of orthopaedists, hand therapists, and physical therapists offer a comprehensive range of services covering the diagnosis, treatment, and recovery from TFCC injuries. What exactly is the TFCC? The TFCC is a ligamentous complex on the small finger side of the wrist. It is a small complicated structure that serves mostly to stabilize the wrist as it rotates from palm up to palm down and back. The TFCC, and the small finger side of the wrist in general is sometimes referred to as a “black box” because it has so many small components, and sometimes it is difficult to determine exactly what part of it is causing pain. So what’s happening when the TFCC is torn? Occasionally, the TFCC is torn in a high energy incident like a car accident, and the wrist has trouble rotating because the bones are unstable. Much more commonly, the TFCC is sprained (stretched out or incompletely torn) but functioning, so that the wrist hurts with certain motions, but generally functions well. How is a TFCC tear treated? If the wrist is truly unstable, surgery is sometimes recommended early on. As long as the wrist joint is stable, which is almost always the case, initial treatment is with splinting to support the wrist. The vast majority of these stable injuries will eventually heal with time. Sometimes a cortisone injection can be used to reduce inflammation if pain persists despite splinting. Occasionally, in cases of persistent painthat don’t respond to conservative measures, surgery is recommended. What is surgery for a TFCC tear like? Surgery for a TFCC tear is an outpatient procedure done with general anesthesia. Usually, the surgery is done arthroscopically, meaning with the use of small incisions and a camera. Dr. Fitzgibbons performs most of these procedures at the Massachusetts Avenue Surgery Center, an outpatient surgery center that provides a safe, patient-oriented experience in a friendly and comfortable environment.